(Dan Trimmer, 2002). 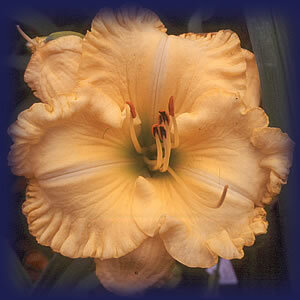 Tetraploid (Kaskel 95-553 X Tetra Ruffled Masterpiece) 25” E Re Ev 6 ¼” This big round rolled back light butter yellow flower has been a joy since its first bloom. 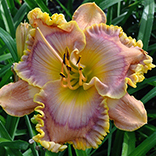 One of my very best early big flowers, and the parent of my very best yellow seedlings this year, I expect California Girl to be the backbone of my future yellow Tetraploid program. Petal width, intense ruffling, and short blunt sepals are the result of crossing a circular Mathew Kaskel cultivar with the extremely ruffled TETRA RUFFLED MASTERPIECE. A good grower and increaser and an easy pod parent, I again loaded CALIFORNIA GIRL with pods this past year.